What is going on behind the scene? It's not pretty. Modus Operandi: The process I go through to produce a comic. Many people seem to be very interested in this part of cartooning. To me is almost tedious. The idea or thought gives me the most joy, but in order to share that chuckle with others these are the steps I must take…. Most people think this is the hardest part. It is the quickest and easiest. You don’t have to do anything to an idea. I usually have a micro-recorder with me when I drive or on the night stand to dictate any humorous notion that comes to me. 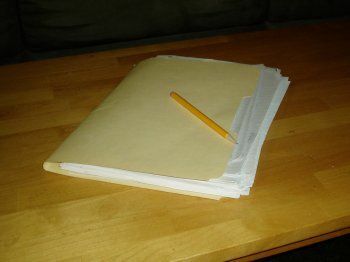 From there I edit the good ideas and put them in my Ideas Compendium – a list of about 800 ideas long and is always growing. My technique is disappointingly low tech. 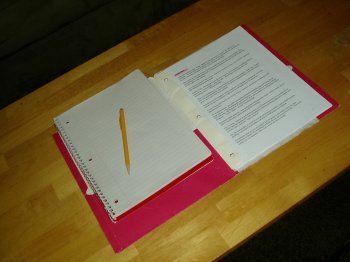 I use regular paper – the cheapest ruled tablet or wirebound notebook paper you can buy. First, with my disposable, mechanical pencil I make a loose sketch trying to nail down the proportions and organizing the idea onto a single 8.5x11 page. This sketch can vary from highly detailed to just a rough image of the main character. Sometimes it is almost identical to the finished product but usually it is about 80-90% complete. Other times it is scattered over several sheets: a character on different sheets, a separate background sheet and maybe details (hands, products, lettering) on yet another. 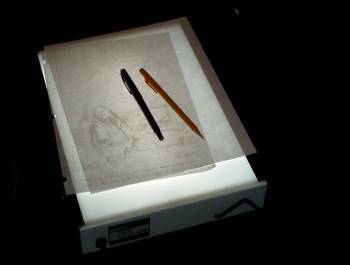 I use a light box to “trace” the “final” drawing in black pen. A quick definition of light box: it is exactly what you think – a briefcase sized box w/ a fluorescent light inside and a white translucent top. Just like the wall version used for viewing x-rays. I loosely trace over the pencil drawing from the lined cheapo paper onto cheapo, plain white copy paper. Often slightly re-positioning the drawing or parts of it in order to fit better or just make it clearer. Sometimes I will trace a “mirror” image by flipping the pencil drawing over. Other times I’ll straighten images or re-use parts of the pencil sketch to repeat a similar object. During this process I try to tighten my drawing and make sure lined connect and loops are closed to aid in the next step. fancy lightbox. Hey, is that Carl? The inked image is scanned into a graphics program. From there it is straight forward. I center the drawing, maybe re-position objects or duplicate or mirror things. Then I add lettering, balloons and a frame. Now it is down to simply dropping color into the graphic. Basic colors, occasional shading and ba-da-bing, a comic is born. Processing, formatting, posting, tagging, etc. are the most tedious part of the comic ordeal. Sadly though, it is the most important part otherwise you are in on an island. There it is: the glamor of sharing funny thoughts with people. Normal childhood. No exotic stories of abuse or mishandling. I spent my summers riding bikes and skateboards, going fishing, climbing trees and generally getting into trouble. Most of this time was spent in western Pennsylvania. High School found me in Tempe, AZ and eventually I joined the US Army for 4 years. After the Army, I sold wholesale products in Houston, TX then moved to the Northwest. Family life required me to settle down with a blue collar job. Eventually I worked my way to a light blue collar job which now affords me the opportunity to listen to talk radio. I’ve had no formal art training. I’m a classic doodler who has taken many sculpting classes at the community college. For years my comics sat idle. I would still write down ideas or even draw one up now and again sometimes submitting a batch or two to the large syndicates or the New Yorker. Responses took forever and were always negative or nonexistent. Comics were largely put aside. Then scanners and software improved to the point where even I could use them. My comics were liberated from both my cluttered mind and cluttered desk. A longtime fan of talk show host Lars Larson, I emailed him some of my right-leaning comics. He liked them and asked if I had more – something I’m sure he regretted. I had gobs (very few on computer, though). I sent him several more asking him: “What does it take to become the ‘Official Cartoonist’ of the Lars Larson Show?” He responded that there was not much in the budget for a cartoonist….. Me: “You had me at ‘Welcome to the Lars Larson Show.’” That was over 2000 comics ago and I am just getting in stride. Thanks Lars. Objective: A new type of editorial cartoon. Beyond normal comics, I draw a hybrid, editorial-like cartoons. Contemporary editorial cartoons use very specific events, labels and caricatures producing sometimes powerful statements but which are very in-the-moment. Often they are hard to discern a week later. Editorial cartoons even 1 year old are almost cryptic. By making my points in generic terms and using stereotypes, a bare minimum of labels and caricatures I hope my comics have a much longer shelf life. My goal is that they can be read years from now and still enjoyed.